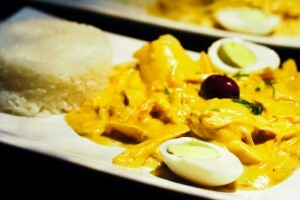 This delicious peruvian plate is prepared in three stages…. Put everything to boil at medium-high hear for about half hour. Take out the chicken and let it cool, throw away the veggies and save the water for later. Put everything in the mixer and mix until smooth. Heat a pan with the oil, onion and garlic until the onion is transparent (5 minutos). Add the chicken and aji amarillo and revolve for a minute. Add the cream and cook until it almost boils moving constantly. If it becomes too thick, add more chicken stock. Towards the end, add the turmeric and revolve well.